Home / Work From Home / Is Remote Work A Good Fit For You? Here’s How To Tell. Ready to work from home? Good decision. Once you break out of the confines of your cubicle, you’ll enjoy time and money saved when you don’t have to commute every day. Plus, there’s the happiness factor that comes with remote work. I don’t know about you, but I know I could always use an extra bit of happiness in life. But just because you want to work remotely, doesn’t mean you should. Here’s how to tell if remote work is really a good fit for you. Did you know remote employers look for a specific set of traits in their telecommuters? That’s because it takes certain soft skills to be successful in the remote world. As a reminder, soft skills are those that cannot be measured. They’re our unique personal attributes that define who we are professionally. Some broad examples of soft skills include traits like leadership, time management, and communication. And these just happen to be the soft skills remote employers seek in their new hires. Think about it — to successfully work from home, you’re definitely going to need to be a leader. Why? Since you won’t have cubicle-mates next door to bounce ideas off of or quickly refer to for advice, you’re going to need to take the bull by the horns on a lot of issues. Remote workers must take initiative, get down to business, and figure out a way to get things done without someone telling them how. Communication too is key to being a successful remote worker. In an office environment, you take for granted how easy it is to update others on your progress. You can walk down to a coworker’s desk and give them a quick rundown of events. Remotely, it’s not so easy. Instead, you’re going to have to be able to effectively communicate — often in writing — what it is you’re working on and what you need from others to keep things moving forward. Can you be trusted to put in an honest day’s work when nobody is looking? That’s why time management skills are highly valued by remote-friendly companies. They want to know (and trust) that their telecommuters are managing their time effectively even though they’re not in a traditional office environment. 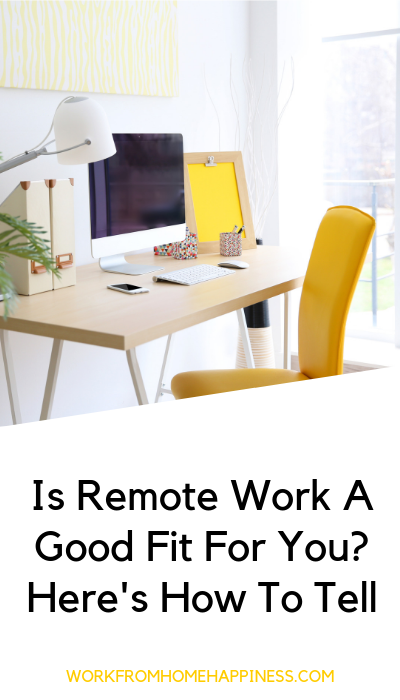 If you worry that you won’t have the discipline to work while Netflix and your cozy bed are a stone’s throw away, remote work just isn’t for you. Period. The type of home office you’ll need will vary greatly depending on the type of remote work you’re after. If you’re an aspiring freelancer, a desk, laptop, internet connection, and comfy chair will suit you just fine. If you’re in the market for a full-time work from home job with benefits, you’re going to need a more substantial home office setup. Some well-known companies that hire remote workers, like American Express, Amazon, and Apple, will absolutely require a separate room dedicated entirely to work. This means a room with a door that locks, is super quiet, and has all the basic office supplies like a computer, keyboard, mouse, chair, and internet connection. Others jobs are a bit more flexible and may only require an area you carve out to dedicate to work like a nook in your living room or some spare space in the den. Whatever type of work you settle on, realize that your couch or bed is not a proper home office workstation. Take a look around and make sure you have the space needed to work efficiently and effectively. Without it, you’ll quickly realize that getting even the most basic of tasks done is next to impossible. I like to talk a lot about the benefits of remote work. There’s greater autonomy, i.e., nobody breathing down your neck or micromanaging your every move. And let’s not forget about the average 50 minutes every day you’ll save without a daily commute. But, this type of work environment is not for everyone. Some people are just naturally social and need daily human interaction to feel connected to work. Are you one of them? Do yourself a favor and think long and hard about that before you jump into remote work. Some days, as a telecommuter, the only words you’ll say out loud are to your cat. (Thankfully, mine’s a good listener). You won’t have lunch dates with your favorite coworkers. There won’t be impromptu water cooler sessions to pass around the latest office gossip. And there certainly aren’t invites to happy hour on Fridays. Instead, the majority of your communication and interaction with coworkers will be virtual. Think of platforms like Slack, instant messenger, and email. Typically, introverts make great remote workers. That’s because they don’t gain their energy from interacting with others. Instead, they thrive in solitude and can easily go long stretches without craving human interaction. Extroverts, on the hand, recharge their batteries socially, often making remote work challenging for them. If you’re an introvert, remote work is probably a good fit. Extroverts, however, should seriously reconsider embracing a work-from-home lifestyle. Working in an office environment gets us used to a certain set of in-office comforts — copy machines, paper, fax machines, complimentary coffee, readily available coworkers, supply closet, etc. When you go remote, you lose these office perks and must rely solely on virtual ways of doing things. For a first-time remote worker, this can be a lot to get used to. Even simple tasks, like collaborating with coworkers and meetings are all done in a virtual environment. You’ll be using a lot of apps and online platforms to get your work done. If you’re already familiar with programs like Skype or Slack, congrats, you’ll find it a lot easier to transition from in-person collaboration to virtual co-working. If, however, you can’t imagine a Monday morning meeting via video or can’t fathom project management while working with someone 2,000 miles away, stop right there! Remote work requires a lot of virtual work via different programs. Being able to embrace (and use) new technology to get work done is what remote work is literally built upon. Feeling more confident than ever that you and remote work are a match made in heaven? I’m happy to hear it! Now it’s time to actually get that remote job search off the ground. Be sure to revamp your resume, spruce of LinkedIn, and give yourself a goal. With the confidence of knowing you’re ready to work remotely and a little help along the way, you’ll be working from home before you know it. You’ve got this. The post Is Remote Work A Good Fit For You? Here’s How To Tell. appeared first on Work From Home Happiness.